Okay, so here’s the first blog of five on the jckrbbt principles. This principle is a favorite of mine; it’s called develop vision <—> create reality. There’s a great quote from Thomas Jefferson in a book my sister gave me; ”I like the dreams of the future better than the history of the past.” I can connect with Jefferson as I’ve uncovered the power within the dreams of our futures–of our ability to develop vision. This ability to develop vision is what actually got me out of the crappy place I was in back in 1992 after an accident took the life of a friend of mine, and caused me to die for a few worldly minutes. I was depressed and stuck for one simple reason–I had no vision of what it would be like, look like, feel like when I got better. Once I got this vision, I began to take the action needed to turn that vision of “better” into a reality. It did not happen quickly, but generating momentum in the right direction is vital! Below is an image of a box I have on my desk. It was given to me by two young friends of mine who happen to be sisters. They gave me the box and the round stone last Christmas, and added the smaller stone as a gift this year. These girls are talented country music artists… and they have a vision. A big, bold, strong one. Then know the power of imagination. I believe they will create a fulfilling career in the country music business as a result of their vision, and the hard work they’ve done and will continue to do to turn their vision into reality. They’ve been to Nashville and played at Tootsies, and The Blue Bird Cafe…and they will return there. Think for a moment about someone you know who is living the life they imagined, or is creating momentum in that direction. I’ll bet you are surrounded by quite a few. 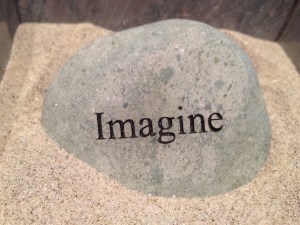 Vision is our ability to imagine something that’s not real. Well, not real in the sense of our physical world, but very real in our brain–in our imagination. This vision is real in a profound way. I see it like this. Why do we feel good when we imagine ourselves on a vacation that is still three months away? Why does a basketball player imagine the ball going through the basket, why does he feel it coming off of his fingertips, hear it swishing thought the net? And all before the referee even hands him the ball. Why does our daughter and her young gymnast friends play their whole beam routine in their mind’s eye before even touching the beam? Because there is power in our ability to vision. If provides focus, inspiration, perseverance, resiliency, and happiness. When I think of people who were great at developing vision I think Steve Jobs, Walt Disney, Ben Franklin, Abraham Lincoln, my best friend Joe, and my wonderful colleagues Joey and Peter. Who comes to mind for you? If you’ve ever seen the movie, Soul Surfer, you know that Bethany Hamilton developed a very clear and strong vision to get back to surfing after a shark attack left her with just one arm. It was not easy, but she is one of the top surfers in the world today, and an inspiring source to many. So, perhaps you can identify two or three areas of your life that you want to be different in six months, or a year. Maybe its the quality of a key relationship, maybe your health, or your spiritual connection, your career/job, your financial situation…just to name a few. Whatever the areas, think about the last six months and then go six months into the future and imagine it different, imagine it really, really good. Now, you’ll want to write that vision down somewhere, and make sure it has a lot of detail in it. But, it’s got to be believable. Be bold, but believable. It’s best to put it somewhere you will see it on a regular basis. I put mine as an all-day event in my Outlook calendar and set it to recur every 4 days. This way I see it often enough that it begins to get into my unconscious. When this happens I believe it is then that we our brain kicks in and begins to drive us to the actions necessary to move toward making that vision real. We begin to notice people and other information in the world that may support us. You see, I believe the brain likes completion. We all love marking something off our list, or cleaning up after a job done around the house. The greatest completion the brain can receive is that of transforming a vision, an image existing only in your mind, into reality. This, for me, is where fulfillment comes in. You’ll notice that this develop vision principle of the jckrbbt model below has a double-sided arrow between develop vision and create reality. This arrow represents action, and this is where most people fail. Countless visions fail to become reality because one does not take or continue to take the actions needed. Once you get clear on your vision, you have to be relentless in asking yourself a very powerful question; “Do the actions I’m taking today move me closer to my vision?” If the answer is yes, well done. If the answer is no, stop and course correct. Life is too short to be focused and exerting energy on actions that do not drive your vision. So, we are off into 2013. I’m not so big on resolutions, but I do love when people continually develop new visions of a better life for themselves–you just need to define “better.” I’ll end here with a quote (you know I love quotes) that captures the power of developing and holding a strong vision.